Can Your Past Influence Your Future? 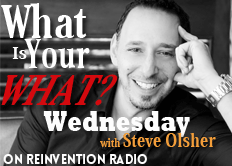 Reflecting on our guest interview with Dave Kehnast, Steve questions the Reinvention Radio Crew on whether or not the past can impact the future. He explains his thoughts on being present versus creating your “pre-sent future”. We can’t do much about the past. We can’t really control the future. Can you create your pre-sent future? The hardest part is self-awareness. How does your past influence who you are today? You’re the only one who will get in your way.